- Mudville is obviously a hick town (it's isn't called "Metropolis" or anything like that, and only 5,000 fans? ), so if Casey is so "mighty," what's he doing playing there? - Furthermore, if he was such a great hitter, why did they pitch to him at all? Why not intentionally walk him? And they didn't even pitch around him, but went right after him aggressively. - Also, if he was such a great hitter, why did two hacks precede him? - Casey, despite his haughty manner, took the first two pitches, maybe in an attempt to work the count. Working the count, trying to draw a walk, etc., are generally considered "an old player's skills." In other words, when a formerly great hitter can't do anything else, he can still draw walks at a good clip because of a good eye and a reputation, at least, for power. - I can only conclude that Casey was a former major leaguer, a one-time star of the game, reduced to playing in the bus league. His name was what the fans responded to, not his ability. The opposing pitcher obviously knew that Casey was not any threat with the bat. The joke was on the crowd for believing in Casey in the first place. - Lastly, if the above conclusion was true, I'd like to share a quick anecdote. Last year I was sitting at a Camden Riversharks game when who did I see coming up to bat, but Dante Bichette! A man next to me excitedly called a friend on his cell phone to report "I just wanted to tell you that Dante Bichette has officially hit rock bottom!" True to the poem, Bichette struck out. Mrs. Pawnking (Pawnqueen) and I would like to announce that we are making roster room for a new callup, expected early next year. We're both hoping that if a boy, he'll be left-handed so his future as a reliever will be assured. Poll: What should be the batting order and why? With all the chatter lately about Abreu hitting first and where to put Rowand/JRoll, etc, what should be the batting order if you were manager? Why? 1) Abreu - Basically a hitter who gets on base almost every other time he comes up to bat needs to hit leadoff. His basestealing and power helps too, of course. 2) Utley - Quite simply the best all-around hitter we have right now, he can both drive in Abreu and get on base himself for the following hitters. 3) Rowand - Good pop in the third spot would equal a lot of RBI for Rowand. His lack of OBP would be less damaging here, and you want to avoid having all your low OBP guys hitting in a row even at the bottom of the order. 4) Burrell - Strong power, good OBP, excellent hitter all around. 5) Howard - Enormous power would keep the pitchers honest for the top 4 hitters. No one would want to face Howard with the bases loaded. 6) Bell - Having a good year, has hit lefties well in the past and can offer some protection for Howard. 7) JRoll - With some decent power for cleanup RIBs, he also has speed which would help with the light hitters coming up behind him. 8) Lieberthal - Some power, and if JRoll is on ahead of him should have some good RBI opportunities. My basic idea is to put OBP guys on first, followed by power guys, followed by speed guys. Of course, Victriano can spell any of the three outfielders, and should be able to hit first, second, sixth or seventh without problem. By putting JRoll at 7th, when he gets on he will have the ability to steal in front of Lieby and the pitcher. Stealing lower in the order is more valuable than high in the order, as the #8 and 9 hitters aren't as likely to hit for power and therefore the extra bases mean more. Ryan Howard can hit the ball really hard. Now, we have a new website to waste our bosses' time: Hit tracker. The actual distance was 461 feet. The ball left his bat at 125.7 mph. Nine of Howard's HRs this year went for a true distance of over 400 feet. Nine went for an actual distance of at least 400 feet. Here's the link to watch the HR. yet, anyway. While we've gone 1-7 over the last 8 games, we've only been outscored by 6 runs. In pythag terms, we should have won about 3 1/2 games over the past 8. This while playing Milwalkee, Boston, and NY Mets, three teams which, according to BP's Adjusted Standings, rank as the best, second best, and best in their divisions, respectively. No, the current losing streak doesn't overly concern me. Manuel's handling of the bullpen, that concerns me. Jimmy Rollin's lack of OBA, that concerns me. Cole Hamels arm, that concerns me. The Phillies' defense, that concerns me. These four things will determine the outcome of the season far more than the past eight games. I have been extremely reserved about overly criticising Manuel, mostly because it's hard to judge the job a manager is doing because a) it's never all that clear exactly what a manager does, and b) the manager has access to inside information we the public may never have. Arthur Rhodes and Tom Gordon combined to throw seven pitches last night, while Ryan Franklin (the eighth-best pitcher on the team) threw 21, including the most important ones of the ballgame. That’s simply a failure by the man in the dugout. I roundly criticised Larry Bowa in his day (pre-blogging) mostly due to his bullpen management. Whatever benefits Mr. Manuel brings to the table, his failures in understanding the concepts of bullpen leverage make me yearn for the days when we might have a manager who can actually make in-game decisions wisely. Last night's loss can be squarely laid at Charlie's feet. Continuing to stick with Ryan Franklin in game deciding situations is destroying the Phils. Two outs in the 8th, tying run at the plate...not Cormi-air and his 0.64 ERA or Closer Gordon and his 1.45 ERA....no, stick with Franklin and watch the lead evaporate. This type of managerial idiocy cannot continue much longer. "Mad Sabermatrician Creates the Perfect Baseball Player's Statistics"
"The VORP of Ty Cobb, the win shares of Barry Bonds, the equivalent average of Ted Williams—I have created the mathematical representation of the ultimate run-producing machine!" said Neeman, holding the sacred Bill James Historical Baseball Abstract above his head and invoking the isolated power of Babe Ruth. Thoughts on the retirement of Alex S. Gonzalez. What's amazing to me is that he had a 13 year career from which to retire. To Gonzalez, we wish him well. While we cheer or boo the great players, we should, I think, stop and remember those whose talent did not match their desire. While we can make fun of a player with an OBP of .302 lifetime, and a career slugging percentage of .391, remember that he got to play in the big leagues for over a dozen years, and you didn't. So hats off to a man who lived the dream for as long as he could. Alex, we salute you with a cold one tonight! You never made all-star, but you did make the show, and stuck for longer than anyone would ever have thought. Well done. I am not now nor ever will say that Rowand shouldn't have caught that ball. It's the kind of play that you remember years later, the kind of moment which will be enshrined forever in Phillies' lore. There are consequences to the catch. Before the catch, Rowand had an OPS of .871, including an OPS in May of 1.067. His replacement, the "Hawaiian Punch" Shane Victorino, has a nifty OPS of 1.104, and is tearing the cover off the ball since he took over in center. Well, consider Bobby Anreu's May slump. In spite of a fantastic OBA of .432, Bobby isn't hitting, with an overall OPS of .884, .626 in May. Plus, he missed two games to a bad back (which might explain his slump). What if Bobby had gone on the DL and not Rowand? So I'd say that catch turned a .308 chance for the Phillies to win into a .592 chance, a gain of +.284 wins. At 10 runs/win, that's 2.84 runs, which is the rough equivalent in linear weights terms of hitting two (randomly placed) home runs. 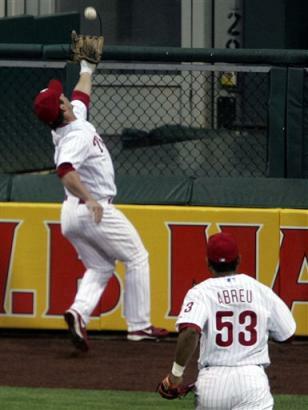 As I said, I am not criticising Rowand's spectacular catch, nor the importance it has in the eyes of Phillies' fans and teammates. However, there are consequences. If the current power outage continues, how much can we lay at the feet of Rowand's nose? Back in Spring Training, I posted about how important one Ryan Howard could be the the Phillies' 2006 success. Last night, King Kong showed why he may contend for the NL MVP this year. After a slow start, Howard has pulled his slugging percentage up to .597. In April, his SLG was an anemic .494. So far in May, .795. To remind you, Howard's 90% BP projection has him going for a season SLG of .750. Now, the bad news is that Howard isn't walking at all, with only 1 walk so far in May, and that was intentional. You cannot continue that kind of thing all year. However, I feel certain that Howard will bring his walks total up again as the year progresses, and currently his power is so great he can get away with it for now. 1) Will the fact that the Phillies' have a great linup prevent Howard from being pitched around too much? 2) Given that, after a slow start, the Phillies have been getting on base at a fantastic pace, and lead the league in OBP last year, how many RBI should Howard end up with in '06? Is 150 out of reach? The NFL record for sacks allowed at that time was 70, set by the 1968 Falcons. The Eagles had allowed 64 sacks with five games left to play. And the situation was deteriorating: right tackle Leonard Mitchell was hurt against Detroit. As the record approached, the Eagles linemen got touchy. “Record? You want a bleeping record? Give me a Van Halen record,” reserve guard Nick Haden told the Philadelphia Daily News. Left tackle Ken Reeves tried to put the high sack total in perspective. “I think out of the 64 sacks we have, that the offensive line has given up 26,” he said in the same article. Making the rounds via 700 Level and Balls, Sticks and Stuff. 1) Crash said he'd been in the minors 12 years, and we find out he's been at least in AAA for part of that time, and he's hit 247 Homers for his minor league career by the end of the movie. That's an average of over 20 HRs a year for 12 years, and all he's ever had was a cup of coffee for 21 days? You don't think he could have outhit, say, Ryan Doumit last year? I mean, isn't a backup catcher with some pop worth more than a cup of coffee? Especially when you consider that it's a short season, and while he averaged 20 a year, he must have had a few years when he hit over 30, maybe even 40! I found it impossible to buy that one. 2) Nuke's first start is being discussed by the Skip and bench coach. In his outing, he struck out 18, walked 18, and had innumerable wild pitches, hit batsmen, etc. I believe if it had been a no-hitter, they would have mentioned it. Now just do the math. 18x4 = 72. 18x3= 54. We're up to 126 pitches at a minimum before hit batsmen, hits, errors, etc are considered!! Nuke had to have thrown over 200 pitches in his professional debut!!! This was the 80s, before pitch counts were considered as important as they are today, but can you even conceive of this happening even 50 years ago??? The manager would have been fired by the organization before the night was through. Please tell me I'm not alone when I notice stuff like this. 1975: Although known for his famous Game 6 Home Run in the World Series, few remember Carlton Fisk's home run earlier in the season that was ruled a foul after he mistakenly waived the wrong way. Thank you to Ryan Madson. Ryan, from what I've seen of how you're handling this, you have class, which isn't something that any amount of wins or losses can bring. It seems obvious that you're disappointed in moving to the 'pen, but you're taking it for the team, and we appreciate it. Keep it up, your day will come. As far as Hamels, I think that we should allow him at least a start or two before anointing him "King?" Remember how jazzed we all were when Floyd and Madson were announced as starters after incredible springs? Major League hitters have a way of being better than triple A hitters. Let's not get so excited that we are setting "Young King Cole" up to be booed if he strikes out less than 15 every game. Lastly, well done to the Phillies for a challenging and enjoyable win streak. Come from behind wins, strong pitching, hitting, and luck all played their parts. Wonderful baseball. It feels "out there". A major rush. I mean it doesn't just feel "out there" but it feels out there. You outta your mind? If you give in now you might start losing. (beat) Never **** with a winning streak. This guy was the most popular player in the game before Tiger. In fact, he would have been Tiger Woods if it weren't for his personal problems. He's currently earning enough to support his train-wreck life, but that will end. I predict IRS woes will follow this book, ending in bankruptcy within the next five years or so. Who knows? Maybe it will be the best thing to happen to him. Righty Scott Mathieson had a 4.14 ERA in Clearwater last year, but was outstanding in the Arizona Fall League and scouts have always loved his big frame and power repertoire. The numbers are catching up to the reviews, as the 22-year-old Canadian has a 37/7 K/BB ratio in 32.1 innings. That's three big time starting prospects in the upper levels for the Phillies, a situation most teams can only dream about. This is a pretty tough choice, because Bobby Abreu and Pat Burrell both had outstanding Aprils. Pat the Bat: OBA .400, SLG .613, 7HRs, 21 RBI - An excellent slugging % has lifted the Phils to many of their April Wins. Bobby: OBA .444, SLG .550, 24 hits and 24 walks leading to 19 runs scored. So, which hitter was more valuable? As much as I agree with "OBA is life" and as big a fan as I am of Bobby, I have to pick Pat Burrell as the offensive player of the month for April. Congratulations, Pat. You're the first ever Pawnking's Phillies' Hitter of the Month! Myers: IP 30.2, ERA 3.23, 2-1 record with 26 K and 13 BB. Pitched a 1-0 gem in Coors field, a feat rarer than a no-hitter or a perfect game. Flash: IP 11.2, 6 Saves, ERA of 0.84, 17K and 5 BB. The most consistent reliever, an absolute lock for the win when he shows up. Generally, the innings the starter gives you is worth more than anything a reliever can do. However, in this case Flash's ERA, Ks and sheer intimidating presense in the bullpen has been invaluable. Despite an April as good as can be hoped for by Myers, Gordon gets the nod. Congratulations, Flash Gordon, Pawnking's Phillies' Pitcher of the Month!